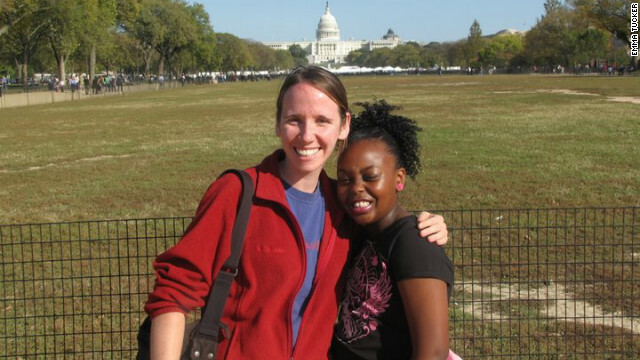 Jenny Shea has been a mentor for Heaven, a student in Washington, D.C., since 2010. Editor’s Note: Jenny Shea is a nonprofit manager living in Washington. She has been volunteering with Project Northstar since August of 2010 as a tutor/mentor. 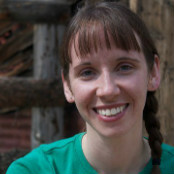 In 2008, Shea served for one year as an AmeriCorps member. She has worked to empower young people in a variety of settings, including schools, church youth groups, Girl Scout troops and summer camps. The kids arrive between 5:30 and 6:30 p.m. on Wednesday. Boys bound up the stairs with their backpacks trailing behind them. A 17-year-old immigrant from Guyana settles into his seat, wisecracking with the adults in the room and challenging the younger kids to games of Connect 4. A little girl with a head full of beaded hair rushes to tell someone excitedly about her day and asks about snack time. Nearly a quarter of kids living in Washington live in poverty, a figure that far surpasses the national average. Project Northstar, a small tutoring and mentoring program, is designed to give these kids a place to go after school for homework help and a stable relationship with an adult outside of their families. Stressful living situations make it difficult for these kids to get one-on-one time with their parents, and overworked teachers can only do so much to give them the attention they need. When I started as a tutor in August 2010, I was skeptical that just two hours a week of tutoring could make a difference in these kids’ education. I had never tutored anyone before, and I questioned whether I could make a difference when crowded classrooms, video games and preteen problems can so easily distract young minds. But my experiences over the past year with Project Northstar leave me absolutely convinced that mentoring relationships are vital to these kids’ development. Mentors provide stability, attention, positive examples, a sounding board and a safe haven. Studies show that mentors give children a positive outlet to express their emotions, which improves their behavior and social interactions. It’s tough for some of the kids at Project Northstar to attend regularly when the rest of their lives have little to no stability: most of the students were referred to the program by social workers after the kids’ families landed in homeless shelters. Others come from families that struggle with day-to-day necessities because their parents don’t speak English and rely on their children - some who have barely learned to read - for translating rental agreements and food stamp applications. On my first night in the program, I was paired with Heaven, a spunky 9-year-old who loves dancing and making up silly songs. Shortly before Heaven and I began working together, her family had moved into a group home after spending time in DC General, the largest homeless shelter in Washington. I learned this piece of her history months after we began working together, because we didn’t talk a lot about the past. We focus more on mastering multiplication, finding books that she likes to read and rapping math equations at our tutoring sessions. We go on monthly outings to museums, the National Mall and to see concerts and plays. I’ve seen a marked difference in Heaven’s progress in math and vocabulary since we began, and the same goes for her reading. Other students in the program have had significant grade boosts as well, with 78% seeing improvements last year. I quickly found that my time with Heaven was an important part of her week, and our monthly outings were sometimes the only chance she had to get out of the house. Shortly after we were paired up, Heaven’s family moved into their own apartment. She couldn’t play outside most of the time because of drug use and violence in her new neighborhood, and her mom’s arthritis makes it difficult to go out as a family. There are many stories like mine that prove the power of mentoring. Katya is a tall, gracefulLatinawho was a freshman in high school last year when she started working with her tutor, Tessa, at Project Northstar. Halfway through the year, Katya’s mother became ill and was hospitalized. Katya was repeatedly taken out of school to travel to the hospital to translate for her parents, and her grades suffered. When Katya’s mother passed away in the spring, the young woman found herself more of an adult than a kid in her family’s structure. It took some coaxing from Tessa to get her to continue the program. Last month, Katya’s report card was filled with Bs and Cs instead of Ds and Fs, and they continue to climb. The better grades gave Katya an increased confidence, and through Tessa’s encouragement, Katya joined the softball team. Now she has another incentive to keep her grades up so that she can stay on the team. Katya’s confidence shines each week as she arrives with a smile for tutoring. Her transformation is a powerful testament to the value of positive relationships between children living in low-income situations and adults who care about them. The future of Project Northstar is uncertain. The director announced that the program is in jeopardy of shutting down at the end of the summer because of a decrease in grant funding. And it’s not the only one. Programs like this around the country are struggling to stay open as they rely on diminishing government and private contributions. I believe that all children - no matter how poor or how privileged - are helped by having relationships with caring, reliable adults. Parents and teachers cannot bear the sole responsibility for our children’s education. It takes each of us investing our time, money, skills or attention to the kids in our communities. We can all be teachers, and we owe it to our children and our future to make that investment. The opinions expressed in this commentary are solely those of Jenny Shea. If you'd like to donate to or volunteer for Project Northstar or explore other ways to improve the quality of life for others, check out CNN's Impact Your World. An engaging and well-written piece, Jenny. Thanks for reminding us that even a small amount of regular time with a friend and mentor can make a big difference! The daily challenges these young women and men face would be too much for many adults. Bravo to them for their perseverance and to you and the other mentors for your service. May we all pitch in to help keep these programs in place! I am not positive the place you are getting your info, but great topic. I must spend a while learning much more or working out more. Thanks for magnificent information I was in search of this info for my mission. What a wonderful organization! It is obvious from reading the blog post that these mentors are making a real impact in these children's lives! What could possibly be a greater gift than to give your time to a child?